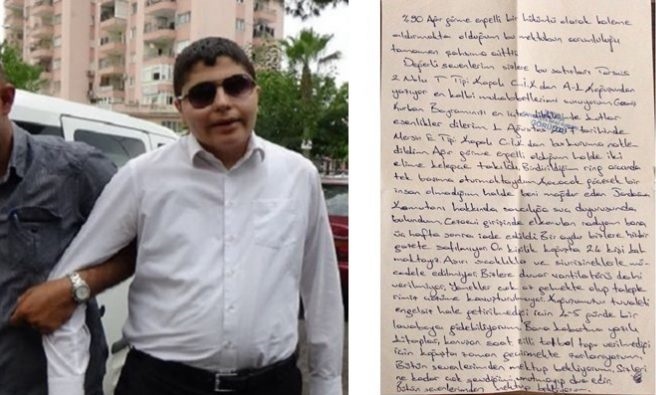 A letter sent by visually impaired Turkish journalist Cüneyt Arat, who was sent to prison last July due to alleged links to the Gülen group, shows that he is having a hard time surviving in prison because penal facilities are not set up for a disabled person. In the letter he sent from a prison in Tarsus, southern Turkey, where he has been incarcerated since August, Arat said toilet facilities have not been made easily accessible for a blind person and that due to overcrowding, they’re available only once in four days. Arat said a total of 24 inmates are staying in one ward which has a 10-person capacity and that they are given an insufficient amount of food every day. “Since I was not given books written in braille or a voice watch, I have difficulty living in the ward,” said Arat, calling on people to write to him. Arat was sent to prison on July 10 after an appeals court upheld his sentence of eight years, 10 months and 15 days. According to Arat’s tweets on July 10, he decided to turn himself in after learning that a Gaziantep regional appeals court had upheld a jail sentence handed down by a lower court. Arat was sentenced on Feb. 22 to six years, three months due to alleged links to the Gülen group, which Turkish authorities accuse of masterminding a failed coup last summer. He was also given one year, 10 months and 15 days for promoting a “terrorist” organization. “Two policemen insulted me and swore at me on the TEM highway. They shouted at me saying, ‘You are responsible for the deaths of 249 people. You are a murderer’,” said Arat in a tweet. He was arrested on July 21, 2016 for social media posts that praised the Gülen group. The disabled journalist was placed under house arrest wearing an electronic ankle bracelet until February. Arat, who has been accused of being a member of the Gülen group, labeled by the Turkish government as the organizer of a failed coup last July, was given a suspended sentence in June by an Adana court for praising Turkish Islamic cleric Fethullah Gülen and the Gülen group he inspired. In his last tweets late on July 10, Arat said his Twitter account would be managed by a friend of his who is abroad if he was put in jail and said he might be tricked and forced to sign some declaration or documents he doesn’t agree with. “Let my friends know that I never did anything I should regret,” he tweeted. In series of tweets after his arrest, Arat’s friend shared photos of him while he was being taken to prison from the police station where he turned himself in.